Photos courtesy of L’Oréal Professionnel. If the warmer months are known for causing frizz, the cooler ones are definitely known for their ability to cause even the best hairstyles to look a little electrified. Static can be an unfortunate side effect of the drier seasons, but thankfully there are a few simple tricks to prevent it from totally ruining your look. Below, we share some of the common causes of static and how to stop it! Weather: In arid climates and during the winter the humidity in the air plummets, which can cause our strands to stand on end. Lack of Moisture: Just like the lack of humidity in the air can cause static, the lack of moisture in your strands themselves can create static. Friction: Ever notice how static hair is worsened when you have to wear a hat? 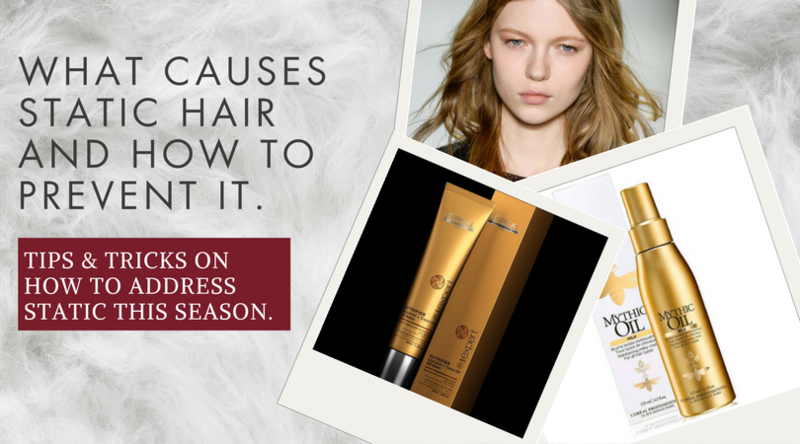 That’s due to the friction of the fabric rubbing against your hair, causing a seriously hair-raising style. There’s not much you can do about the weather, but there are a few steps you can take to prevent your hair from becoming statically charged. Since a top contributing factor to static in your hair is lack of moisture, replenish your hair with hydration. As the weather cools down and the climate becomes more arid and dry, reach for products like leave-in conditioners, hair masks, and moisturizing shampoos and conditioners which can all help to restore the hydration needed to keep static at bay. Pop SERIE EXPERT Nutrifier DD Balm in your bag for on-the-go hydration. If the weather outside calls for a hat, spray the inside of your chosen hat with a frizz-fighting spray to create a buffer between your hair and the friction-causing fabric of the hat. A great option is Mythic Oil Oil Detangling Spray. The spray can even be towed in your bag to help smooth out any static that may occur once you take off your hat. Did you know that using a metallic wire hairbrush may help to reduce static? This is because the static charges attach to the metal prongs instead of your hair! Be mindful to gently detangle before running the metal brush through your hair in order to ward off breakage.